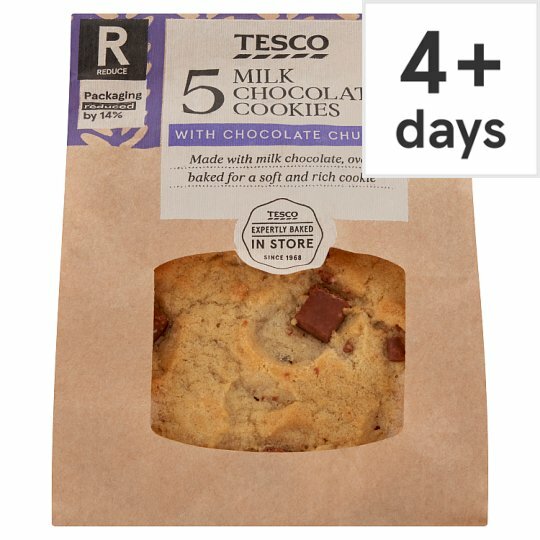 5 Soft cookies with milk chocolate chunks. Made with milk chocolate, oven baked for a soft and chewy cookie. INGREDIENTS: Wheat Flour (Wheat Flour, Calcium Carbonate, Iron, Niacin, Thiamin), Sugar, Milk Chocolate Chunks (20%) (Sugar, Dried Whole Milk, Cocoa Butter, Cocoa Mass, Whey Powder (Milk), Emulsifier (Soya Lecithins), Vanilla Extract), Palm Oil, Fructose-Glucose Syrup, Rapeseed Oil, Water, Invert Sugar, Raising Agents (Sodium Bicarbonate, Disodium Diphosphate, Calcium Dihydrogen Diphosphate, Calcium Phosphate), Wheat Fibre, Whey Powder (Milk), Flavouring, Salt. Contains milk, gluten, wheat and soya. May contain almond, hazelnut and pecan. Our bakers prepare a variety of products in our bakeries, this product may also contain peanuts, nuts, sesame, egg, soya and other allergens For allergens, including cereals containing gluten, see ingredients in bold.